Below him, to his right, Ridler could still make out the bulk of the tithe barn at Alciston and the lights from The Rose that were beginning to flicker through the pervading gloom. The thought of sitting, musing, a pint of Tamplin’s on a rough wooden table in front of him, appealed. To gaze out of the propped bar door into the warm summer evening, exchange a nod – perhaps a word – with others as they arrived would be the simplest of pleasures; but the reality would be far from this fantasy. Glances, stares, suspicion, alarm, hostility, anger, violence: walking into the bar of a public house would guarantee a starting point at any of the increments on this scale of reaction. Further away he could see the village of Ripe; in the pub there he might be begrudgingly tolerated – not that he had ever tried to test the idea. Perhaps even in the inn at Chalvington to its east, the response would not escalate beyond the stares; but away from home, even a few paltry miles, would make all the difference. Ridler walked on; surefooted, upright and bareheaded. The local pubs had embraced the Writer when he first came to Downland but his turmoil inside had begun to show on the outside and – like Ridler - he had become a spectacle to be judged. Nearing the Beacon, Ridler felt a sense of relief: he needed to be out on the Downs, needed to be nearer the sky, be able to feel the air, be able to see the world as far as he could, but he always had a sense that no sooner than he felt free, the counter of confinement tugged at him and he had to return to the fetters he had forged for himself. For over twenty years, he had had to live with the limits of his decision to become a spectacle. He had no regret: he and Gladys had lived well during those years – but a price had to be paid. And he had quickly learned that price. Despite all the attention, the gazes of fascination at the World Fair, there was also opprobrium. In Times Square, he had not seen the man as any different from the amused and opened-mouthed throng who parted as he – literally head and shoulders above them - and Gladys, sightseeing, moved through them. Not different until Ridler felt a smart on the side of his face, felt the droplets of blood on his chin and saw the man, flick-knife hanging lazily, mouthing angry words back at him as he melted into the crowd. Never since had he put himself so close to so many people; and never since had he ventured out without scarf and hat to conceal. 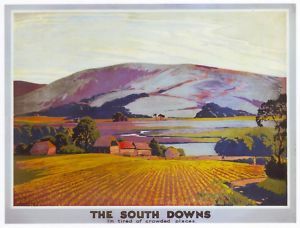 Except here - the Downs – where the warmth of the summer air, like balm to a wound, caressed and soothed his skin.